Description: Pretty, new power leads an empty coal train west to reload. Description: BNSF 9370 leads a loaded coal train bound for Palos Alabama down the Birmingham Sub. Description: Brand new SD70Ace 9370 leads a loaded coal train bound for Palos Alabama down the Tennessee Yard By-Pass track. 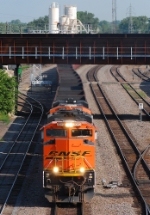 Description: The class unit BNSF SD70ACe. Title: BNSF 9370 w/loaded NSTX hoppers for the CSX. Description: BNSF 9370 leads a coal load through Northtown Yard with an SD70MAC trailing as a DPU. Description: An ACe (AKA:Junk) lifts a DEEX coal load towards 44th Ave, and on an upcoming train is an empty DEEX. Description: An eastbound coal train with an ex-BN "triclops" in the consist trudges up the hill. Description: Part of the first order of ACe's, these were equipped with white numberboards which is one thing that I have always thought strange. Description: BNSF 9370 (with BNSF 5720 and a CSX GP38-2) rest along side the former PH&D office building. Description: The PH&D office building got some big visitors..fresh off taking a loaded coal train to DTE.